Big Cass is stepping back into the wrestling ring for the first time since he release from WWE. 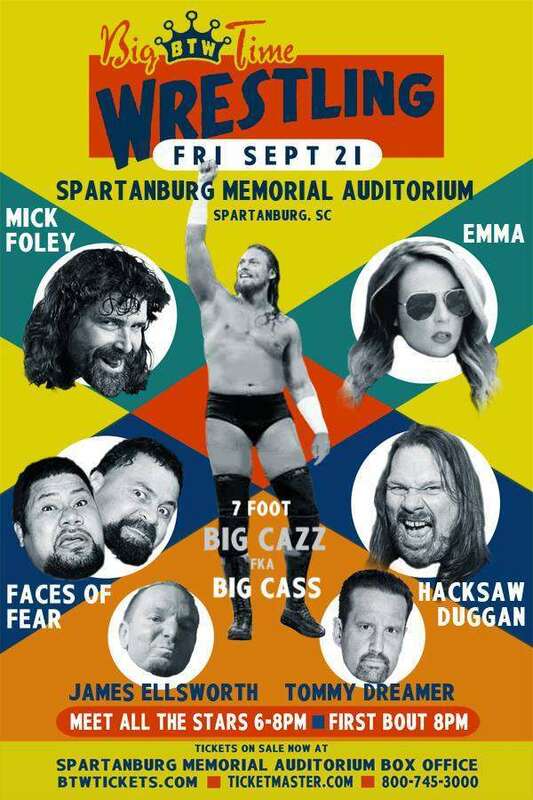 Big Time Wrestling (BTW) is advertising Cass for an appearance at their show on September 21st in Spartanburg, South Carolina. He won't be the only former WWE talent at the event, as Mick Foley, Emma, Hacksaw Jim Duggan, The Faces of Fear, James Ellsworth, and Tommy Dreamer are also advertised to appear. Also notable for the appearance is that Cass' new ring name is being used on the poster for the event: Big Cazz. WWE owns the rights to the name Big Cass so he had to come up with something new, and as you can see, he didn't veer too far away from the name he used in WWE. You can see the poster below. Cass was released from WWE on June 19th. When they terminate a deal, it nearly always comes with a 90-day no compete clause that prevents talent from appearing for another wrestling promotion right away. Cass' first advertised appearance with BTW will come just after that 90 days expires. The release back in June is still something that has some mystery around it as all of the finer details are not known. Cass had just come off of a long term feud with Daniel Bryan that gave some legitimacy to his character for a brief amount of time until Bryan quickly dismissed of him. Two days before his release, Cass wrestled Bryan at the Money In The Bank WWE PPV event in Chicago. Reports circulated at the time of his release that there was some sort of alleged backstage incident that prompted action to be taken. This supposedly centered around some type of situation with his ex-girlfriend, current WWE SmackDown Women's Champion Carmella, though the story has never been confirmed. There was also reportedly a situation in May where Cass had an in-ring segment on SmackDown where a midget was brought out to mock Daniel Bryan. Cass reportedly went off script during the segment, igniting the ire of Vince McMahon. Given how quickly the release of Big Cass came about following a high profile feud with Bryan, it's likely that there were multiple elements at work that lead to his eventual release.